Sara Zarr is a name that crosses every well-read reader’s lips at some point – every well-read reader, that is, except me. Thus, when I saw Zarr’s Story of a Girl sitting quite alone on the shelves of my library, I just knew I had to pick it up; I certainly haven’t regretted my choice. While this was one of the quickest novels I’ve read lately, it packed a whole lot of punch, heart-wrenching scenes, and true character connection in such a short amount of pages. It was provocative, compelling, and is a story I really had to mull over for hours afterwards since it simply would not get out of my head. It wasn’t perfect, but it was perfect in the lessons it conveyed and that, I believe, is what is truly important. From the beginning itself, Deanna was a compelling heroine. While it may seem as if the reader should instantly dislike her for her actions, we are unable to as we see this unfortunate situation from Deanna’s perspective; from the perspective of a thirteen-year-old girl who wasn’t enjoying herself in the backseat of a car with an older guy, who didn’t want to go that far with someone older than her, who wasn’t ready for that type of a relationship, but who simply wanted attention and care from someone, especially if her own family would not give it to her. Thus, within the first few pages itself, we feel for Deanna and pity her situation. Yet, what struck me the most about her tale was that instead of Deanna, her life could have been any of ours. It is basic human nature to want to be loved and cared for and if any one of us were dealing with the same circumstances in life as Deanna, there is a high possibility we may have committed the same mistakes too. No one, though, deserves to be blamed for those actions even three years later, which is where the true injustice of this tale comes through. Now, at sixteen, Deanna still isn’t a perfect character. If anything, she’s in love with her best friend who is now the boyfriend of her one-and-only girl best friend. Furthermore, she still commits mistakes, makes a fool of herself, and is thrown into situations she has no control over. Yet, while this is primarily Deanna’s tale, it is also the tale of her brother who is attempting to be a good father and husband at such a young age. I found the family dynamics in Deanna’s life to be extremely lacking, but her relationship with her brother was one I truly cherished. I liked how much a part of each others’ lives they tried to be and if it wasn’t her brother, it was her brother’s girlfriend who became Deanna’s friend. So, while Deanna did still commit many blunders in this story, she slowly begins to close up the wounds that started three years ago, whether it was forgiving Tom or moving on from her past or accepting her feelings for her best friend or facing the issues her family faced to survive together. But, while I found this novel to be very compelling and a story that grabbed me into its pages and made me feel for its characters, I was just a tad bit disappointed that Deanna didn’t experience more growth. In fact, the ending of this story was very open and while it healed some rifts, I would have liked to the see the culmination and consequences of some of the others. What I liked though, was that Zarr made this a very realistic story. Deanna’s father was a despicable man who I hated for his treatment of Deanna, but I understood him too because of his ego and pride. So, while I wanted their relationship to heal overnight, I’m glad it didn’t – I’m glad that her father is still mostly a jerk, but a slightly improving one. Many aspects of Deanna’s life are left like this and we don’t really know what will become of her or her friends or anyone in her life, but we do know that she is strong enough to have faced all this and come out alive, which means she can face much more in the future. 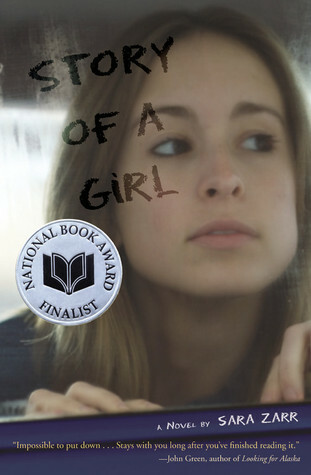 At its core, Story of a Girl is really a story of courage, bravery, and hope and I adored it. It was extremely well written and as far as debuts go, this was impeccable. I will definitely be reading more of Sara Zarr in the future – it’s hard not to be drawn to an author who writes this well. *In fact, there’s a lot more than goes on in this story – secondary characters I loved, conversations I adored, other situations I didn’t bring up, etc. Yet, I feel as if explaining them would take away from their charm, so I hope you will excuse my vague plot summary and check this book out for yourself. It is an incredible gut-wrenching read that will win you over with its subtle form of characterization and I highly recommend it. I've heard a lot about this book but I still haven't gotten a chance to read it. This book sounds like a bit of a hot mess but I'm curious about it. Great review! I really hope you read this one soon, Jenny, as I'd love to see your thoughts on it! :) Deanna was such an easy character to sympathize and feel for and I loved how realistic the entire novel was, despite some of the truly despicable acts that went on in it. It was definitely a very powerful read! this book is completely new to me, but it sounds interesting enough. Great review!! Another beautiful review, Keertana! Shamefully, I haven't read a Sara Zarr book despite my love for well-written contemporaries but I'm hoping to rectify that soon. I don't think I've heard of this one before! I think my jaw dropped a bit about the paragraph finding out Deanna was only thirteen and it's so true what you say about people wanting comfort. Her father sounds awful and I'm glad the journey felt realistic. I know what you mean about character growth, but nice review and glad you liked it.